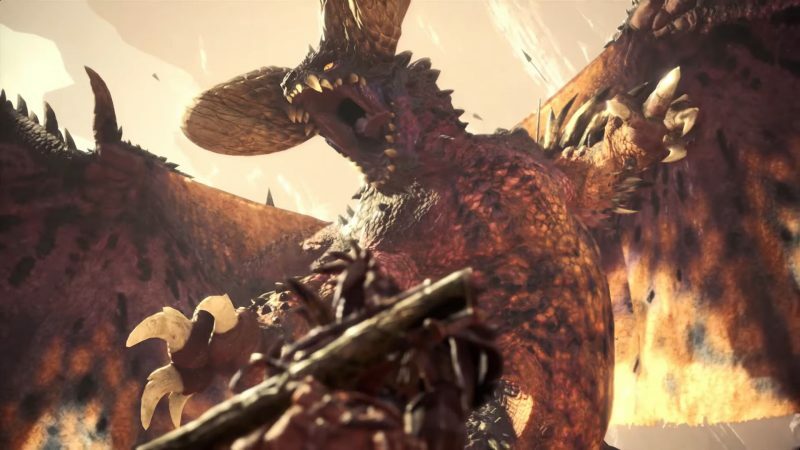 Capcom brings to us Monster Hunter World, the latest installment to this vast ongoing franchise. I’m going to say this right away: I’ve never played a Monster Hunter game before. In truth, it actually pleases me that this the first one since this game is absolutely massive. That’s actually an understatement because there is so much to do in this game that it makes me wonder if the people that reviewed this game prior to this article actually had time to play through the entire game. The world map of Monster Hunter World is separated into six different sections under the title of “The New World”, for storywise purposes. All have their own environmental themes going on. They range from forests, deserts, an oceanic plateau, a necrotic valley, a cavernous locale, and a volcanic and inhospitable landscape. Each of the locales is also gigantic for traversal. Not only are there environmental factors that can hinder your travel or cause you harm, but you will sometimes have to climb, duck, and wade. You even have to fight through other monsters (not main ones you prep to hunt for) and plant life to get to a spot or an area that has a resource that you might need or want. Since all of these places have their own motifs, the main monsters that you hunt in their respective places are all unique and are actually very challenging. Because you have to track the monsters throughout the map, the hazards that you encounter could be an added detriment to when you face off against your actual prey. In some instances, I’ve found myself encountering a completely different beast that interferes with my hunt altogether. Once you’re out of the tutorial, Monster Hunter World gives you several options to choose from in Astera, which is the main hub location. You can get quests, talk to the NPCs for furthering the storyline, or buy items and materials from the local merchant to help you prep. However, the main resources are all within the maps themselves. That means that the merchant doesn’t have everything that you’re going to need. If you’re missing materials, you’re going to have to go out into the dangerous landscapes and hunt for it. You also have access to your own living quarters where you can test out different weapons and armor sets that you’ve attained to see which works best for your style of play. You can access the item boxes from the different hub sections in the main hunter gathering area as well. This made it easier to store and swap out items quickly if I needed to replay a quest again. Forging, crafting, and cultivating are also major parts of Astera. After every successful mission, you can gather up your materials and resources and craft items that will further help your hunter. The higher level the monster, the better the equipment you can make, be it armor or weapons. Also, the weapons and armor will all vary in their statistics and skills. That means you can mix and match your armor and weapons to whatever fits your needs for the hunt or in general. This section where you prep is where all the bread and butter occurs for your character. You can easily spend more than an hour here prepping everything you need just for the next few quests. That’s because as a hunter, you have to equip yourself with the best available items, weapons, armor in order to take on your prey. It goes without saying, the monsters in this game are unforgiving. They will tear you limb from limb if you do not prep properly for the fights against them. The controls for Monster Hunter World can get clunky at times. This has led to many frustrating moments where I’m trying to climb up a vine or put away my weapon, only to get bitten or killed because my character is stuck in animation or the controls aren’t responding to me for some reason (my PS4 controllers are fully charged and responsive to all my other games). I do understand that they’ve designed the control schemes like this on purpose. During combat, this game reminds me of Dark Souls since the combat design of that game is closely in tune with the control scheme. Early on while fighting gigantic predators like the Anjanath, a Trex-like monster, has led to many irritated emotional outbursts from me. At times the character will dodge away from attacks. Other times, I make the same dodge attempt, but instead of dodging, my character ends up barely sliding to the side and I get mauled to death. You have to pay close attention to the weapons that you’re using since no weapon is controlled the same. Despite having a clunkiness at times, the game is still playable and I would say that this would be the only negative point I’d give this game. Other than that, running freely around the maps while slaughtering things eventually just becomes natural. The Monster Hunter World takes place in a location called “The New World”. As part of the 5th Fleet, you’re going on an expedition to the newly untamed continent that has almost every kind of monster and beast that can kill you with one or two bites. With the help of your companions and scientists from the fleet, you will hunt and gather everything for consumption and for research. It’s a pretty cool base storyline that reminds me of the parallels of early Earth explorers as they encountered the vast untamed wildlife of America. That said, all the land and locations are absolutely gorgeous and there’s an actual ecosystem that gives this game life. You’ll see creatures eat other creatures, herbivores drinking and migrating from one location to another, and poop all over the place. Yes, the animals poop everywhere and you can use it to track them. The different environments that I pointed out earlier are really well done, and you can tell that the animators and artists took their time to model a lot of the flora and fauna after our own reality. The day and night cycles are a welcome touch to the world, which makes for a more immersive world. Monster Hunter World is beautiful and extremely immersive, especially when you’re just prepping for the hunts and forging. As I’ve stated, I’ve never played a Monster Hunter title before, and this game was a welcome change to the games I’ve played in the past. I can’t really compare to the previous games, but it looks like they’ve been sharpening the game more and more, and I feel I entered right at the peak. I’m not sure if Capcom can top this title in the future, but if they do come out with another release, I won’t bat an eye. Keep them coming, Capcom! You’ve got yourself a new fan.